You are beautiful – and loving, and deep down you still are fierce. Though you can no longer see my face, and your body fails you time and time again I see you. I see your beautiful face, and the love in your eyes – though vacant – oh they are so full of love. I could look back on these past six months as a time of struggle – but I really don’t. I do however take it as a time of learning, and a journey on a continuum that i had started several months – years before. But really what is a struggle? After all – I am not where Job was – he literally lost everything. Bless the Lord above I am not Job. We’ve always had a “tough” dog. Dad travels a lot, and we feel rest assured to have a protection dog to alert us when danger is near. After Tyler our beloved Rottweiler died we had adopted your brother Eli. You two shared the same mom, but had a different dad. 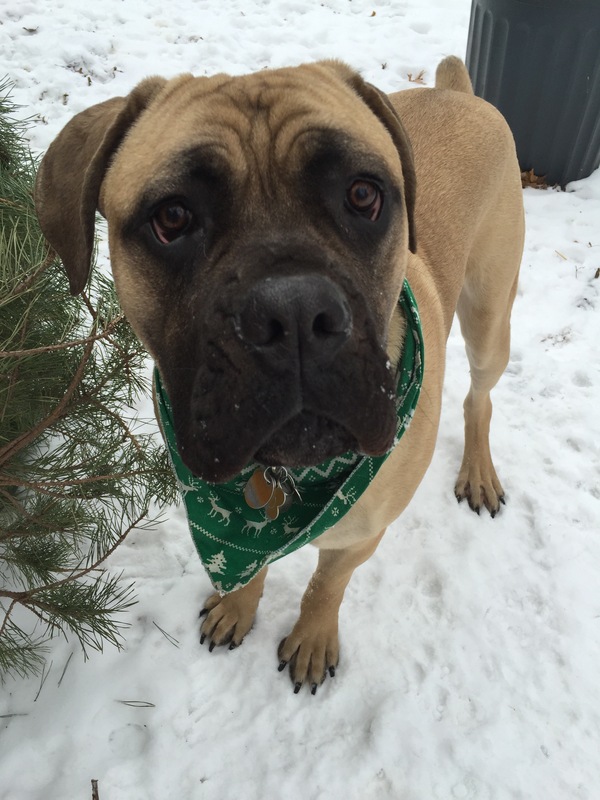 We spent a glorious 3 months with him, but at his age of 5 months – he passed tragically away. He had the same love of eating EVERYTHING that you do Niko – except he wasn’t able to pass things as easily as you. After your brother died we were absolutely devastated and broken. We had lost two of our dogs within three months, and had a little 15 pound Jack Russell protecting our house! She may be little, but she does a great job. We went out to the farm where your mom and dad live to spend some time with other Corso’s just like you! 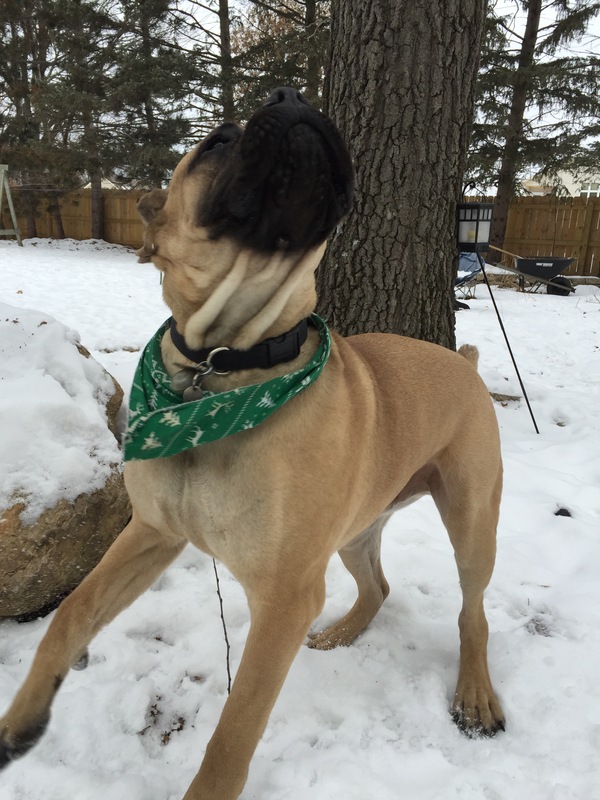 Your breed has near magical powers that make people feel so loved in an indescribable way. When we were there we learned that your mama was going into heat and would have another litter soon. Between November and December we anxiously awaited your arrival and were so excited to learn at the winter cabin that you were born! I’m sure outsiders thought we were adopting a human baby because of our excitement level. Our hearts leapt, and came out to see you and your litter-mates as soon as we were able. We chose you! You were so calm and sweet and a tough little man. We had a countdown calendar to the day we could take you home, and officially call you ours. The night we took you home we cradled you in our arms, and sometimes even now I can still see that expression on your face when you lay across my lap desperately trying to be that 15 pound puppy we once knew. Oh how we had high hopes for you! 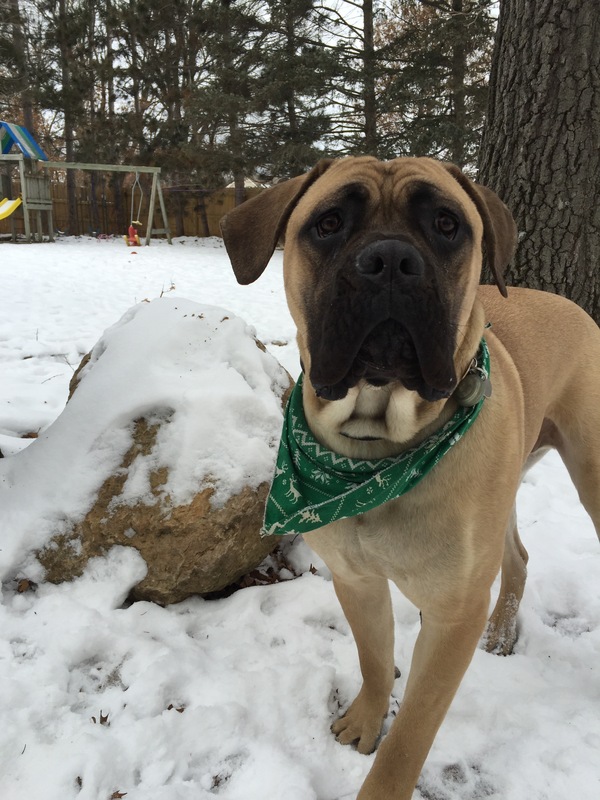 We immediately put you in obedience training – both puppy kindergarten and obedience. You had a strong willingness to learn, and caught on very easily. Unfortunately – mid December when you were just 11 months old we learned that you went mysteriously blind, and suffer from Ataxia. You have trouble walking at times, and fall down a lot. We built a ramp for you out our back door, and see how much you try to map out our backyard. You are incredibly determined, and I think you will overcome this obstacle. We chose your breed to take care of us, but it seems that we are taking care of you. We’ve learned so much from you in just one year Niko. We’ve learned patience like no other and complete trust. You have to trust fully in us to see for you and those times when your legs give out you trust us to bring you to a safe spot. We will protect you and love you Niko- like you would have protected us. We hope dearly to celebrate many more birthday’s with you, but are truly blessed for each moment we have with you now!! ~ In the Classical French Style! I just love cooking. Creating something with my hands, and the ingredients sifting through my fingers. I wanted to create something more classic than the modern fair that has been serving me and my family so well from Pinterest. Not that there is anything wrong with those recipes. I love those recipes, but I wanted a real challenge! While at the grocery store and not having my list, I was in the soup aisle and grabbed some beef stock. On the back was a recipe for Beef Bourguignon. Since we have an entire deer I thought I would easily translate this over to a French Classic version of Venison Bourguignon. How hard could it be? So in the cart it went! After watching several videos last Thursday night 1/1 I settled on a mashup of some professional chef I found on You Tube, and Julia Child. As a young girl Julia Child’s voice drove me nuts and I couldn’t stand her, but now as an aspiring home chef I absolutely adore her! She has so many great tips that you just don’t find in the cooking shows of today, and lets be honest… the girl is hilarious! I could easily see her and I being BFFs! (I know she has since passed) I literally stayed up until 1:00 a.m. watching her videos! She is my hero. I started the process around 1:30 p.m. or so trimming a 1.5# venison roast. There wasn’t much to trim besides a bit of the tallow, so I then cut it into large chunks (slightly bigger than bite size) and gathered my ingredients and supplies. 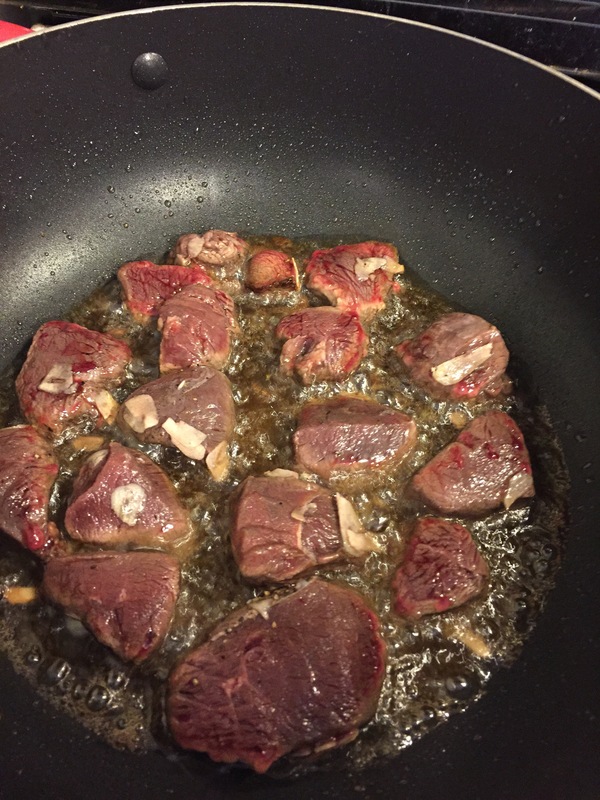 Firstly I sprinkled in a bit of pepper on the bottom of the Batter Bowl and then put the venison chunks. Next I grabbed my garlic slicer (also from Pampered Chef) and rough chopped 3-4 garlic cloves, and then thinly sliced the garlic over the venison. Lastly I poured enough wine over the venison to just barely cover it, and set it aside. Set my oven to 425 degrees and put the 10in Dutch Oven inside to preheat both. Next I started out cutting 4 pieces of bacon into small strips, and then putting them into the large skillet over medium heat to render the fat out of the bacon. After it was nice and toasty I used a slotted spoon (actually the nylon deep fry spatula works best) to set the bacon aside. 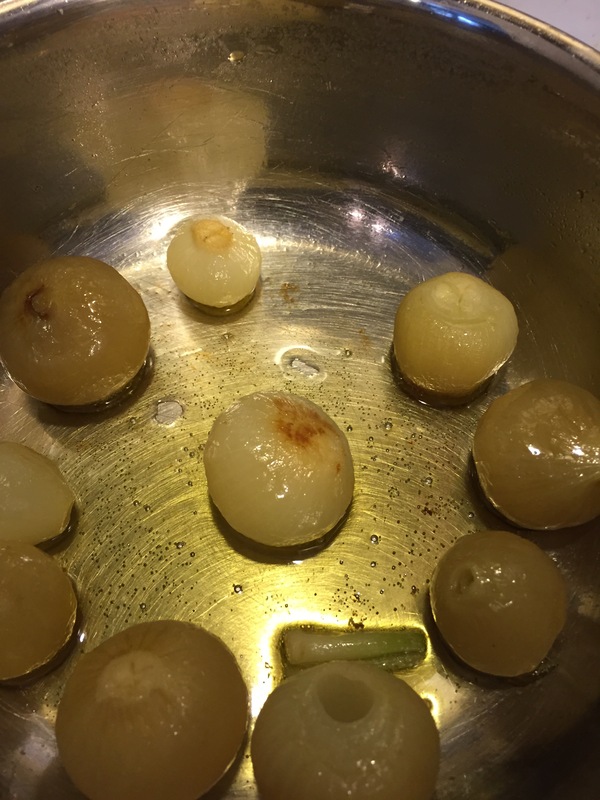 I also started cooking half a dozen boiling onions peeled with some olive oil in a small sauce pan. Normally you would finely chop these, but since my husband hates onions I settled for keeping them whole. While the bacon was cooking I peeled and largely chopped 4 carrots, and peeled about 5 more small (boiling size) onions. You could use a shallot too, but you wouldn’t want your onions any bigger than the shallot size. You can maybe quarter or half these onions, but keep them rather large. My venison was ready to cook. I browned each side for approximately 3-4 minutes per side without crowding the skillet too much, and then set aside leaving all of that glorious bacon fat in the hot skillet. I immediately put my carrots and onions in the skillet with the bacon fat and had on medium heat. I also added maybe 2-3 cups of beef broth. Once my venison was cooled enough to handle I dredged in flour. Don’t make it so that its completely caked with flour – just enough to be sticky and gooey.I then opened the oven, poured in a bit of Olive Oil in the dutch oven, and then placed my venison in there and set the timer for 7 minutes. Now that my onions in the small saucepan were starting to turn golden brown I added in about a 1/4 of tomato paste until cooked down. 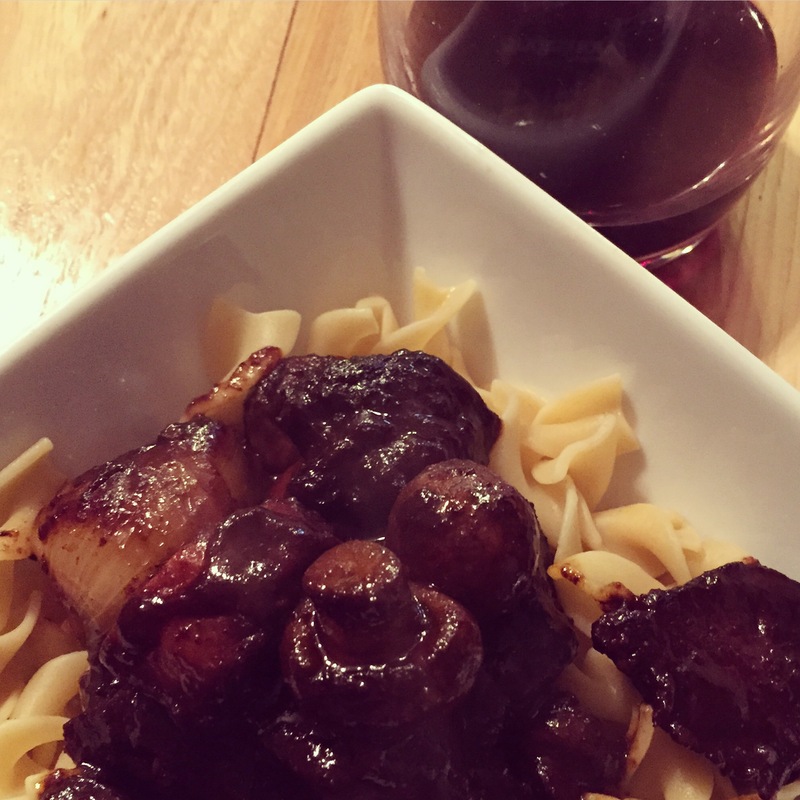 After that I poured my wine marinade into the sauce pan, added the bacon in and turned down to the lowest simmer. Once that came to a full summer I added in a teaspoon of thyme, let it just simmer. Now go back into the oven and stir the venison, and let braise another five minutes. After the five minutes is up, add the entire contents of the small saucepan mixture into the dutch oven, add the lid, and VERY IMPORTANTLY lower the oven temperature to 320 F.
Now I got to just sit back and wait for about three hours while the venison, and the wine, onion, tomato purée mixture cooked for about three hours! 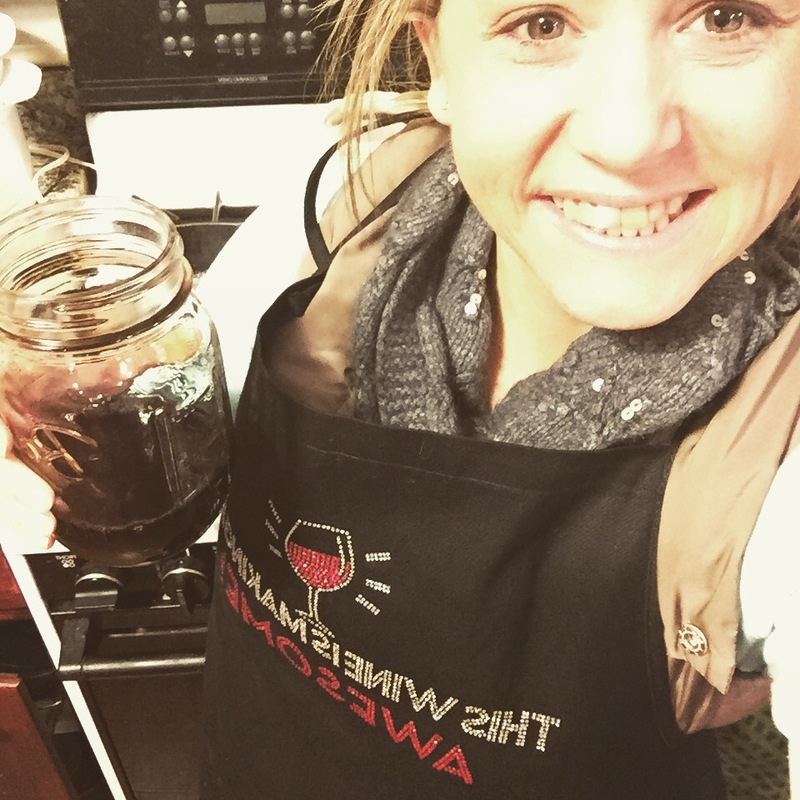 Enjoy a glass of wine and pick up the kitchen while you wait, or scout Pinterest for more fun recipes! At the tail end of the braising I put my daughter to work by having her clean the mushrooms! She thought this was super cool, and felt super important! Once the mushrooms were complete and the three hours of braising was done I added mushrooms carrots and the onions that were previously cooked all into the Dutch oven and roasted for another 20 minutes! While that was going on I started a pot of egg noodles to serve everything over and FINALLY it was time to eat at 6:30 p.m.! I dished everyone up a plate and took my first glorious bite alongside a delicious sip of Marechal Foch from St. Croix Vineyard! I would definitely make this again and definitely on a weekend because it just takes too long to make on a week night. 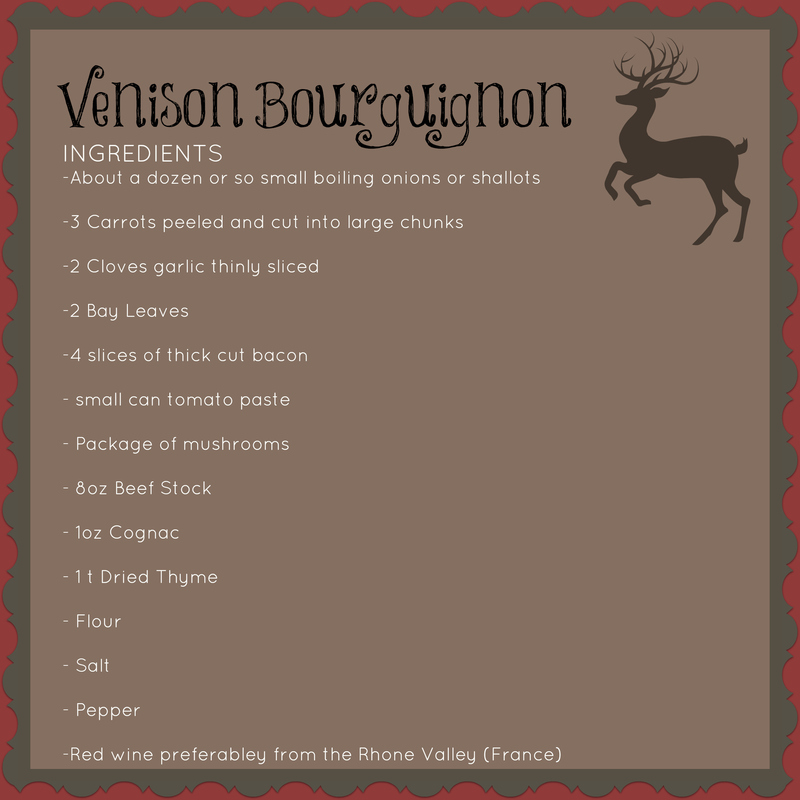 This list is what I used in my Venison Bourguignon. The days are ticking by and with the merriment of the holidays and our daughters play we hadn’t been quite as immersed in planning as before. That changes this month however with requesting of our permit at the end of the month. Everyone entering the bwca must have a permit to enter and between April and October you usually have to put in notice ahead of time. The key date to get your permit is on Wednesday January 28, 2015, at 9 a.m. I of course have my calendar set already! Between Christmas gifts and my birthday gifts we got much of the rest of the items that we were looking for including the epic Bio Lite stove. We even test drove it on Christmas night, and were able to boil water in 8 minutes flat! (I think that’s faster than my own stove-top and certainly faster than my regular camp stove!) We even used the pot that we are bringing to the BWCA so that we could have the most realistic practice. I got out the Playtupus Gravity Works filter system and hooked that baby up too (apparently it was test all of our products night)! Water started filtering like a BOSS! I couldn’t even believe how fast the water filters through this thing! Jason and I decided that right when we get to a campsite we will do the water, then set up the tent, while Kiki gathers twigs for our Bio Lite stove. Later this month we plan to buy the rest of the food that we are planning to bring, to get that all packed in the bag as well. (Just to make sure everything fits – so that if i need to order a Granite Gear Pack) I will know ahead of time. So far we have a few Mountain House meals, and a few of the Bear Creek soups which we will just purchase pouch chicken for to add to it. We also will be brining a box or two of Rice-a-Roni and again adding either dried beef, or summer sausage to that etc. Breakfasts we plan to just bring oatmeal, and we’re still working out lunch and if left overs might be a possibility, or bring crackers and the pre-mixed tuna salad you can find in the tuna aisle. Other than this – we are just trying stuff out to make sure it works, securing a bit more para cord, and at least one one other dry sack (or two). Beyond this – we will likely be renting a canoe from an outfitter, just to make our first experience the best one possible. This next month we will be spending time procuring food, checking our list for whatever else we might need, and of course getting our permit! Mid-month we’re heading up to the winter cabin that our family rents (sans kids) to play games, relax and me hopefully do a little hiking or snow shoeing!